Stanford University’s leaders plan to strip some prominent campus references to Junipero Serra, the canonized 18th-century priest who established the California mission system that critics now blame for decimating Native American communities. 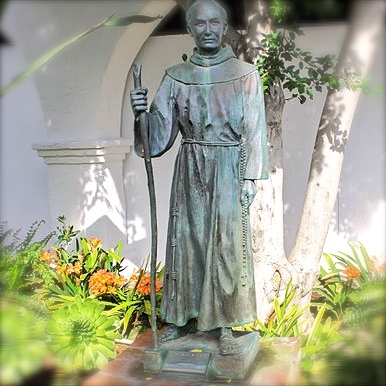 The Franciscan friar was credited with bringing Catholicism to California when it was under Spanish rule, and he evangelized indigenous people. Critics note that he sometimes used harsh methods and many see him more as an oppressor than a protector of early Californians. Serra’s name will be removed from a dormitory and an academic building, both now called Serra House, and from Serra Mall, one of the most prominent and recognizable features of the campus, the university announced Thursday. Stanford’s board will seek approval from local and federal agencies to rename Serra Mall as Jane Stanford Way, after Jane Stanford who, with her husband, Leland, founded the university. The committee that recommended that Serra’s name be remove included attorneys, Stanford students and faculty. University President Marc Tessier-Lavigne recommended prominently using Jane Stanford’s name. Forced labor supported the missions, critics point out, and Spanish troops garrisoned near some missions were blamed for spreading syphilis and other diseases that devastated local communities.